One 200-pin SODIMM supports up to 1GB DDR SDRAM. 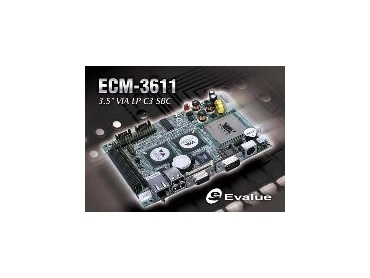 EVALUE Technology has released the ECM-3611 3.5-inch single board computer, providing a multimedia platform for embedded applications. It has an onboard VIA C3 1 GHz processor and UniChrome Pro CLE266 chip which supports hardware MPEG 2 decoding, AGP 8X 3D graphics and both CRT and LCD dual display technology. It also has AC97 Audio, 10/100Mbps Ethernet, type I/II CF, dual SATA and one PCI-104 interface. The ECM-3611 has one 200-pin SODIMM that supports up to 1GB DDR SDRAM. The platform also offers networking and I/O options, including AC97 stereo audio, VT6103 10/100BaseTx fast Ethernet, four USB 2.0 ports and dual Serial ATA interfaces for high-speed storage transfers and hard drive upgrades. Additional functions can be added with one PCI-104 slot and one Compact Flash socket. It is suitable for POS, kiosk, thin clients, set top boxes and other appliances that require a low-power and low-heat dissipation single board controller.